The boys are doing standardized testing online this week. This is the time of year that I always usually question whether we’ve done enough, done well, done the right things, etc. If you’re a homeschool mom I assume you’ve known those feelings at some point. This end-of-the-school-year feels much different. We have seven children now and only three of them are schooling. The rest require my constant attention while they’re awake. That makes schooling quite difficult. US Geography Flashcards NOW AVAILABLE!! My cycle 3-related geography flashcards are finally ready! 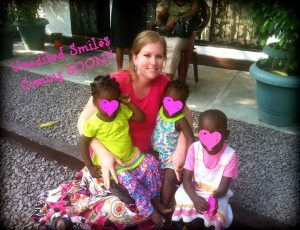 Once again, all proceeds go toward our remaining adoption expenses for our three daughters in DR Congo. At this time, I am only offering the digital download because I’ll be having a baby any day now. Once we settle in with our new addition I will offer to make complete, color, laminated sets for $35. The digital download is $5 and can be paid for by clicking the “Donate” button to the right of this page. You do not have to have a Paypal account to make this purchase. You can use Paypal to process your debit or credit card. Your downloadable link will be sent via email within 24 hours of your completed purchase. This is an invaluable fundraiser for our adoption so please feel free to share the link to this post, share on Facebook, and tell your local Classical Conversations community! I was talking with a friend at church yesterday. She has three young children and she asked if I had any advice for cultivating thankfulness in our children. I think I might have jokingly said, No, do you?? The truth is, I think most of us (Americans in general) struggle with discontentment. Discontentment is the condition of being dissatisfied with one’s life or current situation; a restless longing for better circumstances. We’ve been on a journey to living a simpler life over the last several years. It has brought about great joy and peace. I am richly and abundantly blessed to have a strong, godly husband who desires to be the spiritual leader in our home, to have six children and to be able to stay home and educate them myself. The last ten years have gone by so fast, I can’t even imagine sending them to school for 40 hours each week. We serve together, work together, cook together, read and learn together, travel together, spend time with family and friends, and of course worship together. Even with all of this, we still find things to complain and dispute about. Discontentment is a heart issue. When we complain we are telling God, Your best isn’t good enough. Your provision isn’t quite enough. Your sacrifice on the cross for our freedom and salvation just wasn’t enough. But we forget about those things when we don’t get the results we’ve worked hard for, maybe the money runs out before the end of the month, or how about when God says wait and your 9-12 month adoption turns into a two year, $100,000 adoption? What if we eliminated complaining from our lives? What if our homes were void of whining and disputing? Would we automatically become more thankful with the absence of complaining? I am on a mission to find out! As we sat around the breakfast table this morning I introduced “Thankfulness Bootcamp”. For the next seven days we’re going to work hard toward complete elimination of complaints in hopes of cultivating thankfulness in our home and in our hearts. We’re also going to work toward memorizing the scripture verses at the beginning of the post. Garbage in, garbage out. Praise in, praise out. If we fill our hearts with the truth of His word and His commands to be thankful and content in all things, then out of the overflow of our hearts our mouths will speak! Today is day one. Day one is Discontentment Detox. We are encouraging one another by using a code word anytime someone slips up and complains or whines about something. This includes a discontent attitude. I reminded the boys that a proper response is not just in your words, but your attitude as well. Our code word is “camp.” So far, so good. However, tomorrow and for the rest of the week we will all wear a rubber band around our wrists. Any time we slip, we’ll snap our rubber band. It’s not meant to be painful or punishment, but a reminder of the goal we’re working toward. We really are having to retrain our brains not to complain. Unfortunately, it has become a very normal reaction. Can you imagine your home being 100% complaint-free? What a difference that will make in our family. Matthew 5:14-16 says, You are the light of the world. A city set on a hill cannot be hidden. Nor do people light a lamp and put it under a basket, but on a stand, and it gives light to all in the house. In the same way, let your light shine before others, so that they may see your good works and give glory to your Father who is in heaven! Last night I was tired and didn’t have a plan for dinner. I enjoy working in the kitchen and cooking from scratch. I’m feeding my family, my hands prepared the food, and the results are right in front of us for our benefit. Last week I canned almost 20 quarts of organic chicken stock. The tradition of rich, homemade bone broth is why people suggest you eat some chicken soup when you’re sick. If you eat Campbell’s chicken soup from the can when you’re sick, well, you just might get sicker. However, the nutrients in homemade bone broth pack a punch that can boost the immune system and help your body fight off just about anything, not to mention it is absolutely delicious. I mix and knead the dough until it’s pretty stiff, but not dry. These are just long sheets of pasta that need to dry a little bit before we run them through the fettuccine attachment. If we were making lasagna, this pasta would be ready to use! After drying for 15-20 minutes, we run the pasta strips through the fettuccine attachment. It’s really a pretty simple, fun process. These are our leftover noodles after making chicken soup last night. I’ll leave them out to finish drying and then put them in the pantry for another meal. Dinner was very simple, but it was delicious. Everyone had at least two bowls of soup. It’s amazing how your body craves more when you’re consuming rich nutrients. I ate the last bowl for lunch today. Don’t be afraid to try making things like pasta at home. You’d be surprised how easy it is to make your every day food items from scratch. It just takes a little time and a few simple ingredients. Hopefully by now, you’ve had a chance to either look at a copy of my European and World geography cards or you purchased them yourself! I have worked extremely hard on these maps and cards and it is such a joy to see them come to fruition and see them used and loved by fellow CC families. The fact that this has all happened at the tail end of our adoption has been completely providential. Just a couple of months ago, we had about $5,000 left in fees and travel expenses. My European and World geography cards have sold to CC families in every single state in the US as well as several countries abroad. I have received many positive reviews from families who have said these cards have helped their five year old better understand the geography portion of their memory work. I’ve even heard from Challenge parents who are using my cards to help their middle and high school Challenge student. My husband and I were scheduled to leave for Africa on October 6th, but due to some political unrest in the Congo, we had to delay our trip by two weeks. The delay also added more expenses to our bottom line and that was discouraging. Suddenly, I realized I had two extra weeks to finish my cycle one-related geography cards and make them available for purchase. These cards will be great to use when reviewing your geography from last year as well as preparing for your next round with cycle one. I simply created these for my children last year to help us master our geography at home and in class with my abecedarians. 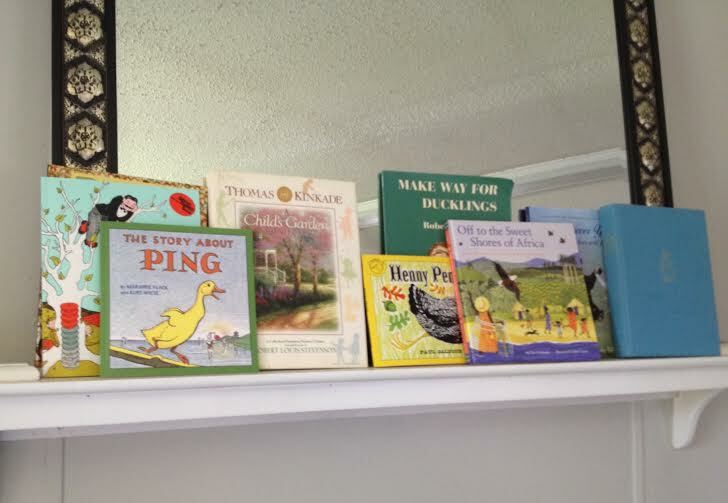 They were a huge success and I wanted to make the same resource available to other homeschool families as well. I must tell you, I originally planned to sell the download for $10. It took me weeks to finish these, they’re in color, labeled, ready to print and use. But then I started to think about the fact that you still have to print them, fold the labels over (each map and label are side-by-side so you’ll fold each label over to the back after you print). You may also choose to glue the entire thing to a 3×5 index card for better durability, and if you’re like me, you’ll laminate the finished product! Therefore, I’m only asking $5. Will you please help me spread the word about my new cards? We leave in eight days to bring our daughters home–FINALLY!! One last thing: How to purchase. You can pay using the donate button on the right side of the screen. Please use the memo/comment box to note the email address you would like me to use when I send your download. If you would like for me to do all of the work for you, I’m happy to send you color, laminated geography cards for $35, including shipping. However, since we are about to go from three children to six (three of which do not currently speak English), and we homeschool, I’m going to need to ask for a grace period. 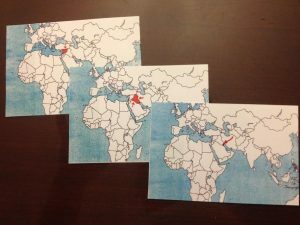 If you’d like for me to send you a set of completed geography cards, I will need four weeks from your date of purchase to complete and ship them. Ask someone who has purchased the download and done the work herself: It’s definitely worth paying someone else $35 to do it for you! This morning, our girls had a successful visa interview at the US Embassy. Their visas will be issued any day now! From there, our in-country staff will get to work on our exit process prior to our arrival. Yesterday was our second-to-last Sunday at church without our daughters. These kinds of milestones really get my heart racing–it’s really that close! We expect our passports and visas to enter…the girls’ home country…will be delivered by Friday. I think I’ll be able to breathe a little easier after we have those back. Owen is doing very well. Thank you so very much for all of you who prayed for him last week. That was probably the sickest I’ve ever seen any of my children. His final meningitis cultures came back negative–Praise God! This post is going to be short because I’m exhausted and have a very sick little boy on my hands. Yesterday, we spent the entire day in the hospital with our youngest. He had a high fever, splitting headache that wouldn’t let up, and was complaining of neck pain. He had lots of blood drawn and the results ultimately led to a spinal tap to check for meningitis. We still don’t really have answers except that it is not bacterial meningitis. We will know in a few days whether or not it is viral meningitis. He has been on antibiotics now for 24 hours and is still running a fever and feeling pretty yucky. His headache returns as soon as his pain medicine wears off every few hours. We are praying that it is not meningitis and that the Lord will heal him very quickly. On top of little man’s health stress, we have been made aware of some new in-country fees and unexpected expenses. At this time, we still need $5,000 to make it back home with our daughters. We know the Lord is going to provide as He already has for every need up to this point, but it can’t hurt to be honest and make our needs known to our village. If you can help, donations can be made using the donate button to the right of this page or you can make a tax deductible donation through our church. If you would like the church’s mailing address, please send me a private message by clicking on the “contact” tab at the top right of the screen. We ask that you please pray with us for our son’s complete healing, that no one else gets sick during or leading up to our trip, and that God would continue to provide the finances for the last leg of our journey. Please share this post with anyone who may be able to help.